Owned by a brother and sister with the restaurant business in their blood, a new Chronic Tacos franchise is making a splash at the Palms Hotel & Casino. Jennifer and Jonathan Lewis, owners of a new Chronic Tacos franchise. Las Vegas residents Jonathan and Jennifer Lewis are a brother-and-sister entrepreneurial team. 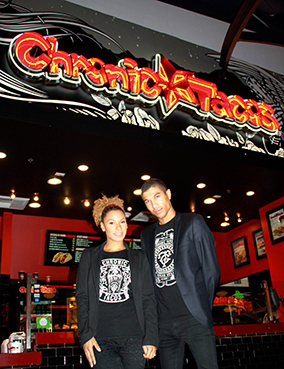 In October, the twins opened Chronic Tacos, which instantly became the only black-owned franchise restaurant in the Palms Hotel & Casino food court. That the siblings seemed to inherit aspirations for enterprise is no real surprise. They are the offspring of renowned McDonald’s franchise owners Harold and Tina Lewis — who owned and operated 10 McDonald’s restaurants before their recent retirement. For quick pickup options, orders can be placed online at EatChronicTacos.com or by calling (702) 477-0414. The digital presence and memorable fare appears to be helping spread the word.